Mrs. Nkoli Edoka (MBA, MA, ANIM, FCS.) Is an experienced Investment Professional with over 14 years of progressive experience in the Capital Market and Investments. The key area of expertise includes General Finance, Financial Advisory, Securities Dealing and Asset Management. She holds a Masters degree in Investments & Finance with a pathway in Investment Banking & Capital Market from London School of Business & Finance & Masters in Business Administration and Management majoring in Finance from Lagos State University. 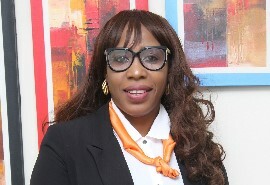 Prior to joining Cowry Asset Management Limited in 2012 as the MD/CEO of the Securities Arm and presently Divisional Head Retail Banking, Nkoli worked in various capacities with IDEAL Securities and Investment Limited between 2004 – 2007 as a Marketing Executive, Operations, portfolio manager and authorized Securities Dealer, and later moved to Primewealth Capital Limited in 2007 through 2012 as the Head, Capital Market and Head of Business Development & Securities Trading. She also worked at Afri-united Services Limited (Maritime) between 2000 – 2004 as Finance personnel and Nigerian Ports Authority (Abuja) between 1999 - 2000 as Corp Member in Admin Department. Nkoli has undergone many International Training/courses and currently functions as a Council Member of the Chartered Institute of Stockbrokers (CIS), Fellow of the Chartered Institute of Stockbrokers, an Associate Member of the Nigerian Institute of Management (chartered) and Certified Pension Institute of Nigeria etc. Nkoli has a proven track record in linking corporate vision to the delivery of desired results through people empowerment and the effective use of resources, processes, and technologies. She has demonstrated the ability to plan, develop and manage investments with a keen focus on maximizing gains while maintaining appropriate risk tolerance levels. Nkoli is a strong motivator and supervisor with effective leadership, communication, decision making, problem-solving and interpersonal skills, together with a bottom-line corporate focus and a results-driven attitude.